DannyShane kicked off the year at the annual London Bike Show. This international expo encompasses all aspects of on- and off-road cycling, triathlon and multisport, as well as outdoor, travel and active lifestyle. DannyShane once again joined the ranks of international apparel companies and stood out with a striking display of unique eco-conscious cycling and lifestyle garments. The reception of DannyShane as a brand and the lively designs struck a note with visitors – consumers from all over Europe fell in love with DannyShane’s signature looks: While the Retrospective designs were favored by most competitive road cyclist, Plaid seemingly took the hearts of avid mountain bikers, crossers, and commuters. The overwhelming consumer response and resulting high demand of DannyShane products lead to many other inquiries as well. “Currently we are evaluating a lot of sponsorship requests” says Christian Beer, DannyShane’s Director of Global Digital Sales. “People love our products because they stand out, they’re different, and they’re unlike anything you see or get to wear.” Sponsorships will be announced in April . 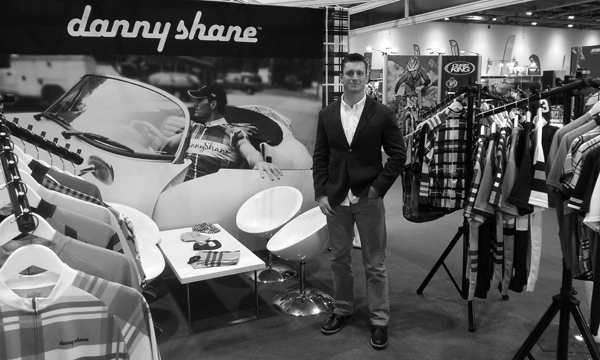 As a result of the high demand of DannyShane products at the London Bike Show, Shane Hunt, Creative Director and CEO, reports that a new Distribution Channel is in the works: “We have signed agreements with a large, independent company who will help us in promoting the DannyShane lifestyle and bring our products to the U.K and to Europe.“ The partnership is expected to be officially announced in the next two weeks.